Your hair is composed of keratin, a strong fibrous protein, and is built from cells similar to those of your skin. The average number of hairs on the human scalp is 120,000, although blondes tend to have more and redheads and brunettes less. of its diameter. A single scalp hair can hold a weight of 100g and an average head of hair twist together can support 23 tons. nerve and muscle supply. You’re born with a specific number of follicles, which can’t be changed, and the size of your hair follicle determines the thickness of your hairs. The shape of the follicle determines whether your hair grows out straight or curly or wavy. 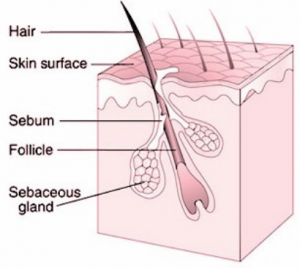 At the base of your follicle, lying on the dermis (the deeper layer of your skin), is the papilla – the bulb of hair where most growth takes place. The nerves and muscles surrounding your follicles give your hair its tactile properties, allowing you to feel the slightest movement. It is these muscles that contract and give you ‘goose bumps’ when you’re cold or threatened. The blood vessels that surround your follicles carry the nourishment your hair needs to grow. This is one of the reasons why your diet is so vital for healthier hair growth and strength. The hair bulb is a structure of actively growing cells, which eventually produce hair. Cells continually divide in the lower part of the bulb and push upwards, gradually hardening. When they reach the upper part of the bulb they arrange themselves into six cylindrical layers. 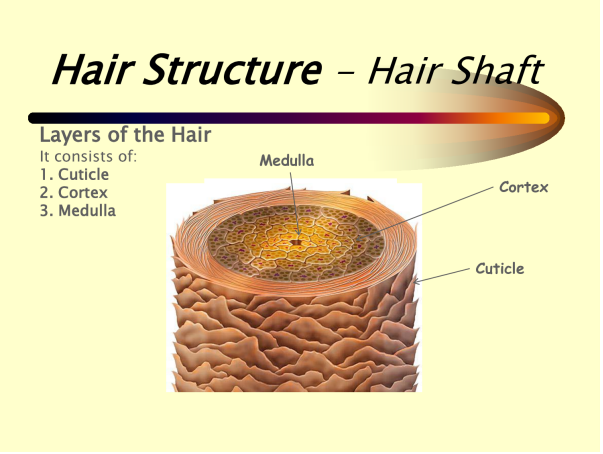 The three inner layers become the hair – made up of the cuticle, the cortex and the medulla – although the medulla isn’t always present in hairs with a thinner diameter. The outer three layers become the lining of the follicle and form the inner root sheath and basement membrane, around which lie undifferentiated cells. Specific cells in the hair bulb, melanocytes, make the pigment called melanin that gives your hair its colour. Your hair shaft is the part of your hair that can be seen above your scalp. It is made of a protein called keratin, compacted and cemented together. Keratin is a remarkably strong protein, which is very resistant to wear and tear. It is the same material that skin, feathers, claws, nails and hooves are composed of. Keratin is a sulphur-rich protein, with ‘disulphide’ bonds holding the protein strands together. This plays an important role in any chemical process like perming, relaxing and straightening, which break disulphide bonds and reset them to a different configuration to change the shape of the hair. Your hair shaft is also made of hydrogen bonds, which help to give hair its flexibility. They are weaker and more numerous than disulphide bonds and are easily broken with the application of water – this is what allows you to change the natural shape of your hair with tongs or straightening irons. A protective layer composed of overlapping cells, like fish scales or roof tiles, but facing downwards. The outer cuticle holds your hair in the hair follicle by means of a Velcro-like bond. It also minimizes the movement of water (moisture) in and out of the underlying cortex. However, chemical processes and weathering can lift the cuticle and disrupt this balance. When healthy, i.e. smooth and intact, your outer cuticle gives your hair shine and protects the inner layers from damage. Forms your hair’s main bulk and pigment (colour). It consists of long keratin filaments, which are held together by disulphide and hydrogen bonds. The health of your cortex depends largely on the integrity of the cuticle protecting it. It is useful to understand the hair growth cycle in order to recognise and understand many of the problems you can encounter with your hair. The hair growth cycle consists of three distinct stages – anagen, catagen and telogen. Your hair grows around half an inch a month, and faster in summer than in winter. The growth phase, or anagen phase, lasts an average of 3-5 years, so a full-length hair averages 18 to 30 inches. The anagen phase is generally longer in Asian hair, and can last as long as 7 years, with hair being able to grow up to a metre. At the end of the anagen phase, your hair enters the catagen phase – a short transitional phase that lasts approximately 10 days. Lastly your hair enters the telogen phase, a resting phase when your hair is released and falls out. 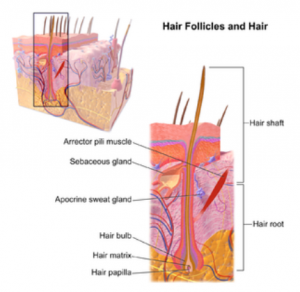 The follicle then remains inactive for 3 months and then the process is repeated. Each hair follicle is independent and goes through the growth cycle at different times, otherwise all your hair would fall out at once. Instead, you only shed a certain number of hairs a day – up to 80 hairs on a healthy head of hair. Hair loss, hair thinning and problems with hair growth occur when the growth cycle is disrupted. This can be triggered by conditions such as nutritional and medical issues, illness or stress. For instance, six weeks after intensive dieting or a health issue you can experience telogen effluvium (diffuse hair fall). This occurs when your anagen phase is cut short and many hairs enter the telogen phase at the same time. If your hair growth cycle is constantly challenged, you may find your hair will not grow as long as it previously used to. This is because your hairs are never allowed to stay in the anagen (growing) phase long enough for your hairs to reach the desired length.